This blanket is so beautiful and I love the colors. Thank you for sharing this pattern with us. I haven’t crocheted for quite some time but am getting ready to go again ~ this will be my first fun thing to do. Thank you for this beautiful blanket pattern. I will enjoy making it. This is very pretty. I like the idea of not having to tie in ends so often. I have wanted to try this type of changing colors and this would be great. It is so gorgeous. Thank you. I LOVE that you give the different sizes. Wish everyone did or at least give the multiples to increase. This technique is also known as Apache Tears..nice to see a version that does not cut a thousand threads. Such a great idea I hate the weaving ends in, that’s why normally I don’t make a blanket with different colors if I want different colors i’ll use verigated yarn. This afghan I would actually make Thank You! Thank you for the lovely pattern. I have never seen this type of stitch before. What a wonderful way to integrate different colors without having to weave ends in. I hate weaving ends in and have always chosen to use variegated yarn instead. Thank you also for the info on different sizes! This is a keeper. I made this blanket for my son in tan, light blue, and navy blue. He is nine years old and asked for a blanket that he could keep until he, “gets old.” We were looking for something that wasn’t too childish or girly. I knew when I saw this one that it would be perfect. He is also projected by the doctor to be at least 6’4″ when he is done growing so I needed one that would be a very large blanket as well. With the size chart you created I was able to make an extra large for him. He loves it!!!! Now my daughter (10) wants one done in different colors. Looks like I’m not finished yet. Starting with a chain of 205, making the first sc of the first foundation row in the second chain would result in 204 sc. So each of the foundation rows should have 204 stitches. There are two stitches at the beginning of the 4th row, 40 stitches between the *’s which are repeated 5 times and then two more stitches at the end. It sounds like you have an extra stitch in your foundation rows and that you didn’t make the two sc at the beginning of the row that are not in the repeated section. thank you very much. I have been working on it and finally figured out what I was doing wrong. Your reply Makes me feel better because I’m getting ready to start the 1st. row of the pattern. So pretty–can’t wait to start! Can you please tell me what the reverse side of this blanket looks like? Thanks!! Finished the blanket, for a baby, with pale pastels. Came out gorgeous–new mom and grandmom were thrilled. Thanks so much! Clever!! I hate weaving in lots of little ends, but I never would have thought of making them a design feature! Your patterns are beautiful, and so many of them–and so many that will be great for charity stitching, too. HOW will I ever choose which one to do first?? Thanks for sharing! I love this blanket and want to make it for my god daughter. However. we are in Australia and use UK terms so would have to convert. I dont mind doig that but cannot cut and past from the PDf. I find it too confusing converting as i go. is there some way i can obtain this pattern in UK/Aus terms? Would it work if I made a PDF of it for you in UK/Aus terms? Your instructions say to make all stitches in the front loop after the first row. Is that the first row in the repeating patter or after Border Row 1? Thanks in advance. I am making this with grey, teal, and white and can’t wait to get this finished! The row after the row made in the initial chain. With the pattern says you start with the border first, then start row 1. Correct. Make the 3 border rows then begin row 1. I am not sure I understand how you are changing color. At the end of the row when you have two loops left on your hook, you pick up a new color and drop the beginning color and finish the stitch. You then do the same for the next color. Wouldn’t you be left with extra loops of previous colors that aren’t worked? Or are they somehow worked into the pattern? When you get to the end of the row using color A and have the last two loops of the last sc, before YO and pulling through those last two loops, drop yarn color A and use yarn color B to YO and pull through the two loops to complete the sc. You don’t drop any loops, just switch the yarn you are using. You will use color B to turn and continue back to the other side. The color A yarn will be extending off that side, but will be used again when you come back using color C and will switch to color A. All loops are worked but there are always two extra sources of yarn that will be extending from the opposite sides. Thank you. I did a swatch using 45 chains to see what you are saying and I see how it works. 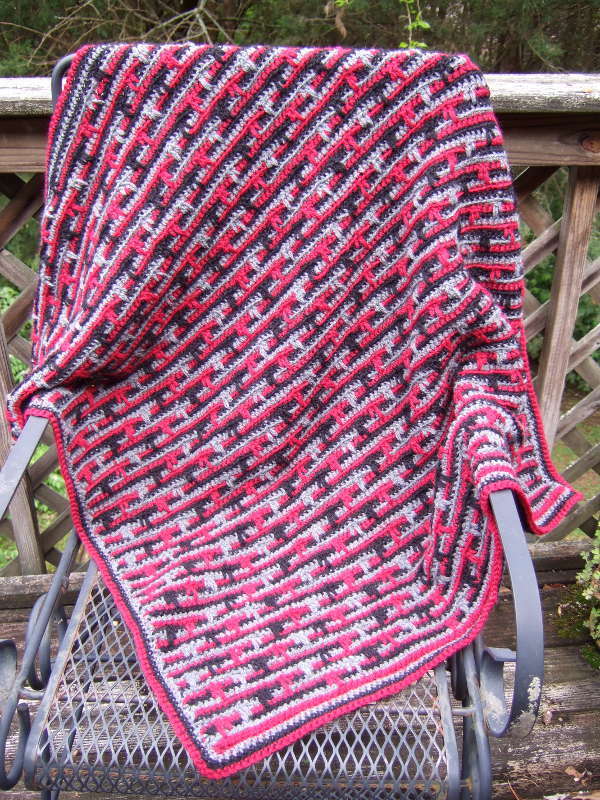 I am trying to decide between doing the ribbed ripple reversible afghan or this one. I know it really is subjective, but about how long does it take to make the small size for this one? Also, even making my small swatch, the colors seem to be getting tangled with each other. Do you have a suggestion and how to minimize that? The ribbed ripple reversible will go at least twice as fast because it’s in dc versus sc and doesn’t have the extra yarn to deal with. My only tip on keeping the yarns from tangling is to untwist them every few rows so that they don’t get knotted.